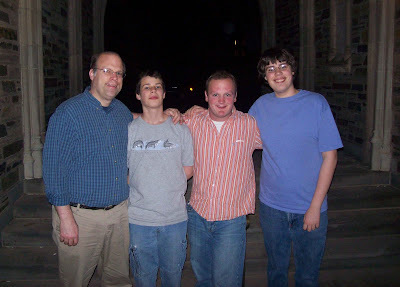 Nathaniel was so thrilled to get a visit at Princeton from Uncle Sam, Christopher and Daniel. Nathaniel said that their visit (and outdoor concert) capped one of the best days ever at Princeton. Did I mention that Nate just handed his senior thesis in? Bentley Farm - trees are just about to burst forth with all of summer's greenery. Dad, Jacob and I spent a bit of the day cleaning up around the model home. After the development project ended, a lot of organization was left behind. Jacob drove the trailer to a less conspicuous spot. Dad and Jacob (it took two tractors) moved the dumpster. And here I am in my silly sun hat. I moved a ton of branches, big tires, electrical wires, bramble bushes and silt fencing. It's definitely looking better! I can never, ever be too busy to catch a picture of the sun setting in the Catskills!